The Guardian journalist, Miss Arwa Mahdawi, clearly had plenty of time on her hands to research use of the word “bro” in the USA, being sure to develop the theme of black and white differences and doing her best to rubbish our country’s special relationship with the USA and our Prime Minister in the process. Just what you would expect from The Guardian. Sadly, she missed a much more intriguing possibility. Look at the picture. Is there anything special about the handshake? Could this be a Masonic greeting? Miss Mahdawi is no doubt well-educated but I suspect she would know little about Freemasonry and it may not have crossed her mind that “Bro” or “Brother” is the universal greeting among Masons. There were quite a few US Presidents who were Freemasons: George Washington, James Monroe, Andrew Jackson, James Polk, James Buchanan, Andrew Johnson, James Garfield, William McKinley, Theodore Roosevelt, William Taft, Warren Harding, Franklin Roosevelt, Harry Truman and Gerald Ford. Might Barack Obama have taken the three degrees of Masonry? I rather doubt it! Freemasonry bans two topics in its meetings – religion and politics. It is not a religion and it is not political in any sense. However, membership requires belief in a Supreme Being and the Craft is strongly steeped in tradition and moral values. Obama’s left-wing views and his attraction to political correctness would make it unlikely that he would feel attracted to the principles of Masonry and I rather suspect his wife would not encourage membership despite the fact that there are plenty of Lodges for lady Masons. What neither of them may know and what I am sure Miss Mahdawi of the Guardian does not know is that one of the earliest US Lodges was Prince Hall Lodge, founded in 1784 as the African Lodge No 1 within the English Constitution and subsequently re-named as the Prince Hall Lodge. Prince Hall was an African slave and a campaigning abolitionist of slavery. Rather more intriguing, the US dollar bill contains Masonic symbols as does the Statue of Liberty. 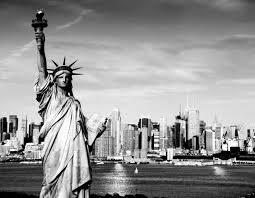 Masonry in the USA is much more open and much more accepted than in the UK. While I do not agree with the style of US Masonry with mass initiations and mass membership, I do think their openness and public acceptance provides UK Masons with some real lessons. Finally, to our Prime Minister. Might he be a closet Freemason? There are few senior politicians we know to be Masons apart from George Canning in the 19th century and Winston Churchill in the 20th. I fear the silly falsehoods and resulting paranoia that Masonry still endures in the UK have probably prevented many senior politicians from pursuing a Masonic career or at least admitting to it. Sadly, I fear Freemasonry is not our Dave’s style and, even if it was, I suspect his media instincts would tell him not to engage. This is his loss. So, to conclude, I doubt the handshake between Barack and Dave had any Masonic connotations and neither did the salutation “bro” between two members of their metropolitan elites. However, a better educated journalist with a wider and more open-minded perspective might have enjoyed that alternative speculation. 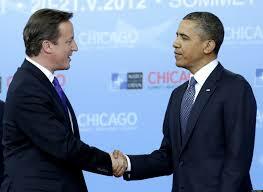 This entry was posted in Freemasonry, Politics and tagged brother, Cameron, freemasonry, handshake, mason, Obama. Bookmark the permalink.